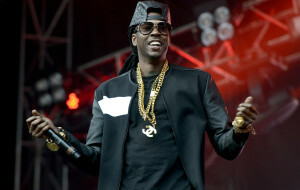 Famous rapper “2 Chainz” made the holidays of a disabled veteran very good and fun filled. Single mother Deirdre Plater who resides in Palmetto, Georgia, hasn’t been able to find a job for the past year, which has made it difficult for her to make ends meet. The rapper who is a native College Park, Georgia, learned of her situation and decided to pay her a visit Saturday. 2 Chainz did not come empty handed, he bought new furniture for Plater’s apartment and and also offered to offset her rent for the year. 2 Chainz used the proceeds for the “Dabbing Santa” sweaters he is selling online to help pay for the furniture and Plater’s rent . ” 1 Life 1 Love” 2 Chainz is a quote from from the online shop for his Christmas sweaters. 2 Chainz posted on Instagram about the importance of giving back, remembering that he grew up poor. 2 Chainz born Tauheed Epps graduated second in his class at North Clayton High School. 2 Chainz was also a standout basketball player and later attended Alabama State University on an athletic scholarship. He has won and been nominated and won several awards including, over 13 BET Hip Hop Awards, bringing home 4 trophies, earned the Source Magazine’s “Man of the Year”, and was nominated for three Grammy Awards, including Best Rap Album. The rapper made a guest appearance on NBC‘s Law & Order: Special Victims Unit it aired on May 8, 2013. He also appeared as himself in the second season (episode 16) of CBS sitcom 2 Broke Girls, where he travels on the same private plane as the two main characters. 2 Chainz is the CEO of independent record label “The Real University” (also known as “T.R.U.”; or “The Real U”), formed in 2015. He also heads up the T.R.U. Foundation, a charitable organization.